← Should You Turn Down Your Next Promotion? Meet Kate – the corporate type. She joined the company as soon as she graduated. She worked hard because she really wanted to have a great career. Her efforts got noticed and she quickly got promoted. She was considered a talent. She worked even harder and moved up the ranks. She is now in her mid-40s. She just found out that she was made redundant. This shouldn’t be a surprise. This is the expected natural course of a corporate career. It is a painful realization but it has always been the case. The only difference is that due to the economic recession the average age of moving out’ has been decreased to mid-40s. Don’t take it personally. There is no need to start beating yourself and think what you could have done differently. You really didn’t do anything wrong. This is how corporate works. Unfortunately, nobody had told you that before and you were unprepared. Take some time off. Don’t rush into conclusions. Go on vacation, if possible. Have some fun. Clear your mind before you start reflecting ‘what’s next’. Consider it as the mid-point of your career – and NOT the end. We will live longer. Most of us will have to work until our 70’s anyway in order to increase the value of our pension fund. So, don’t take it as the end of your career. 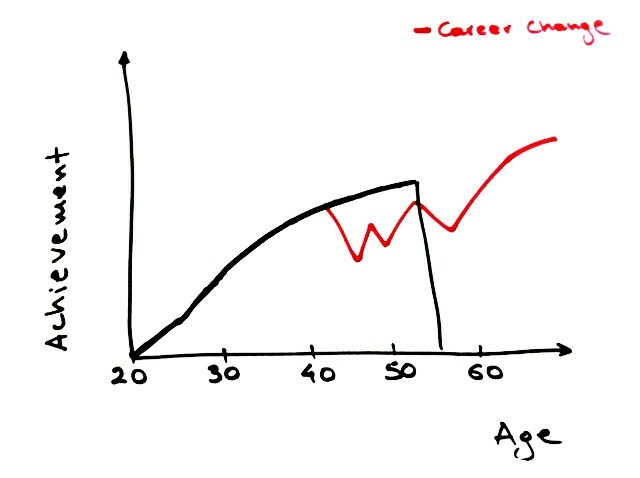 On the contrary, take it for what it really is; the mid-point of your career. You will probably have at least 20 more years to work. Check your finances. On the one hand, you probably have significant financial responsibilities at this age. On the other, you might have been lucky enough to get a good redundancy package. Check how long you can allow yourself before getting a job. Is there anything you can do to minimize your costs? Can you do some freelance work? Identify your strengths and interests; What are good at? What do you love doing? What motivates you? Generate Options; Which jobs fit your abilities and passions? Think Long-Term; Where do you see yourself in 10 years? Do you need to get any new skills? Connect the dots; Putting all the pieces together will enable you to find ‘what’s next’. You may of course decide to go for a job similar to the one you had in another company. Remember though that there is an expiry date on corporate careers – you learnt this the hard way! If you consider changing career, take your time to find out what you really want to do. Becoming redundant after investing what you consider your best and most productive years in a corporation may be frightening in the beginning. Most individuals though after going through the initial shock find it to be an empowering experience. Dealt correctly, a mid-life career crisis provides you with a second chance to find what you truly want to do. The bottom line: Don’t bury your head in the sand and think that this will never happen to you. Look around; how many colleagues do you have who are above 55 years old? Have you gone through this type of experience? If yes, it will be great to share your learnings. Korina Karampela is the founder of b4iapply, author of 2 books, consultant and speaker. She has held senior positions in the pharmaceutical industry and has an MBA from MIT Sloan. Her b4iapply blog is recommended by The Guardian for professional development. This entry was posted in b4iapply for a job, Career Advice, Job search and tagged career advice for your midlife crisis, career tips, mid-life career crisis, tips for career change. Bookmark the permalink. The info above is fine but a bit idealistic: “Find out what you really want to do. Having spent two years with people on unemployment, many similar to Kate, I’ve learned some ugly truths. 1) Employers want ‘young and dumb’—who’ll work cheap and learn the company way. 2) It’s a tough time to change direction or re-invent yourself. Focus on what you’ve been doing, but keep in mind that you may need to humble yourself to keep the bills paid: waitressing, retail, temp jobs, and leave the “what you love doing” to volunteer work, til the right opportunity comes along. Terry, you are right that it is tough to change direction. Employers prefer people ‘ready to contribute from Day 1’. So those who want (or have) to re-invent themselves need to find ways to master the necessary skills and this may take time. People who anticipate the next phase of their career and are proactive will have an advantage. I’ve enjoyed your site/blog and would like to refer readers to you from time to time. With your permission, I would like to refer readers to your blog from time to time when I write about issues that you cover. Please let me know if this is acceptable to you. Thank you for your interest in b4iapply. Please feel free to refer to the materials of the blog when necessary. Also, I had a look at your blogs; they are very interesting and I am certain many of the readers of b4iapply will find them useful. These are all great tips. For those who are experiencing midlife crisis, this is one perfect site to deal with your problem. Thanks for sharing us your thoughts.Hope to read more from your article.